For a better audio experience, listen outside the box. 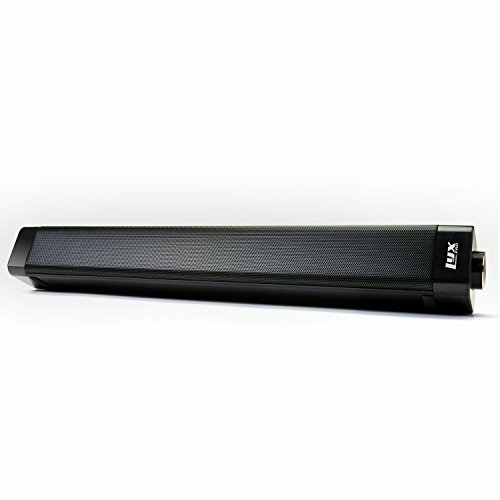 Discover cinema-quality sound in portable pint-sized form with the Mini Sound Bar from LyxPro. This powerful speaker system is specially designed for use with your home theater, laptop, tablet, cellphone or similar smart device, freeing up wires so you can listen anytime, anywhere. Dual connection methods make it easy to pair the speaker wirelessly via Bluetooth; or hook up your electronics via the included 3.5mm cable. A premium li-ion battery provides hours of play time as you listen to movies, Netflix shows, podcasts, music playlists and other audio entertainment via convenient remote control. Whether you're playing tunes in the office, projecting a movie or going mobile with your kids' iPad programs, never settle for second best sound. Hit play like the professionals, and add a Mini Sound Bar to your cart today! - Portable entertainment for home and travel! LONG-LASTING RECHARGEABLE BATTERY - Built-In Lithium Ion Battery Supports Many Hours of Play Time; Includes USB Charging Cable to Power Via Laptop, Etc.